A wonderful atmosphere promises you your stay in the beautiful 3-star Hotel H TOP Olympic, the ideal place for your holidays on the Costa Brava. Not far from the sandy beach, the hotel makes holiday dreams come true and sun worshipers will find relaxation. 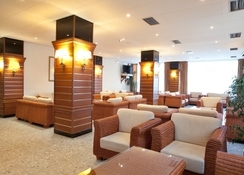 The conference hall in the holiday hotel in Spain exudes a tranquil atmosphere. Surrounded by Costa Brava, this Spanish hotel offers a terrace, a balcony, a garden or a sun terrace for relaxing outdoors. Are you looking for sports and events at the hotel in Spain? The TV room is the right place for this. The beach, city center, restaurants and bars are excitingly close. 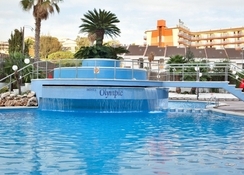 Hotel H TOP Olympic in Calella is ideal for those who want to enjoy a beach or party holiday. For the younger guests there is a kids' club, so families here enjoy a relaxing holiday. The hotel has a pool area with a separate children's pool and many other amenities that you can use for free during your holiday. From the Hotel H TOP Olympic in Calella, you can reach the 3.5-kilometer long sandy beach on foot in less than 5 minutes. Restaurants and bars are just 100m from the hotel. The center of Calella is a 5-minute walk away. Calella is a charming old town, characterised by narrow streets and bazaar streets. Popular with visitors, the resort is located on the Catalan Costa del Maresme and is an hour's drive from Barcelona by car. 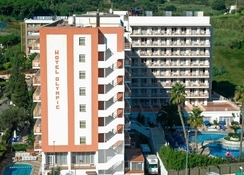 Hotel H TOP Olympic has a total of 517 rooms equipped with private bathroom, satellite or cable TV, air conditioning, safe, central heating and balcony. Guests can choose from twin rooms, single rooms, double rooms, and double rooms with pool views. Guests can also take all of these rooms with an extra bed. 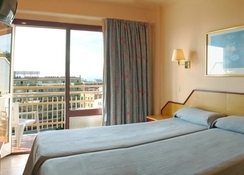 Room amenities include air conditioning, a balcony or terrace, a safe, a telephone and a bathroom including toiletries. Hotel H TOP Olympic offers all-inclusive rates. 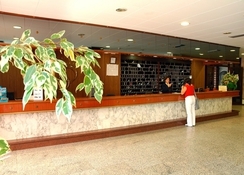 This rate includes meals and drinks that are consumed in the bars and restaurants of the hotel. A supplement may be applied at some restaurants, or for certain menus or dishes, drinks or other services. Enjoy your favourite drink in the bar or lounge or at the bar next to the pool. Hotel H TOP Olympic has a spacious entrance hall with lifts, lounges, reception area open 24 hours, a cosy bar, an air-conditioned restaurant, a circular pool surrounded by palm trees and terraces with sun loungers. Outside the hotel you will find parking spaces and a playground. A minibus links all the H. Top hotels three times a day, so you can move around free of charge and use the facilities of all the hotels. In addition, the beach offers a wide variety of activities such as swimming and other sports: water skiing, diving or surfing. They have animation staff and bicycle rental service. My recent stay at the hotel was very enjoyable and staff were friendly and helpfull. As cheap as chips for our last-minute booking in June. 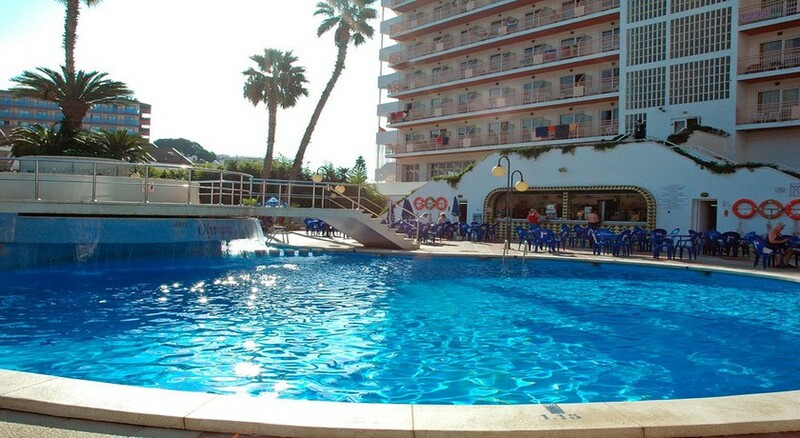 The hotel was very clean, the beds were the best I’ve ever slept in on holiday, the food was really nice (even my super-picky husband found something he liked every mealtime), the pools and pool area were good and the drinks were fine too. I especially enjoyed the “cocktail of the day” every day. It’s not a 5* star hotel (but neither did we pay 5* prices) but we thought it was a very good 3* hotel. We would certainly go back and have no hesitation in recommending it to others. 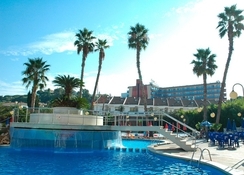 Week in June 18 All Inclusive last minute booking Teletext holidays. My wife and I arrived around 1400 and were allocated our room which was large enough for 2, but would have been very cramped for 4 as there were 2 single beds pushed together with 2 further beds underneath. The bed side lockers were moveable to allow all 4 beds to be set up. There was a double built in wardrobe with a safe (additional Charge) and a narrow desk with a large mirror and 1 chair to use with the desk, although if you did this there was not enough space for anyone to pass you. A reasonable large bathroom with a bath with mixer taps to convert to a shower with a shower curtain running the length of the bath. A large mirror fitted above the sink with single use shower gel, shampoo and soap supplied along with 2 large and 2 small towels. A balcony with 2 chairs above one of the 4 pools with a view of the main street down to the beach and in the foreground the newly opened Mercato supermarket that was like a uk main food store. Arriving at 1400 meant lunch was still on as it runs from 1300 - 1500 with burgers, hot dogs, chips and salad available between lunch and dinner. All inclusive meant that dig in and fill up. Food was good always something to eat at all meal times. Lunch and dinner had a choice of serve yourself drinks, red or white wine, beer, water and a selection of fizzy soft drinks. The table were all set with cutlery, wine glasses and paper of liner napkins depending on he meal. Soft drinks in wine glasses was different. full continental, a variety of bread and rolls with a selection of cold meats and cheese, biscuits and buns. Cooked breakfast, scrambled egg, beans, transparent bacon and boiled eggs. The show cooking area 5 out of 7 days fresh pancakes cooked to order and fried eggs every day. A selection of cereals, fruit juices and hot drinks available. Selection of bread and rolls, various side salads made up with a selection of cold salad ingredients and cheese and ham for those wanting a full plate.chips, chicken or pork burgers, hot dog sausages, various fish and mostly pork cooked various ways and paella or white rice with potato and fresh veg. Lots of fresh fruit and deserts. Similar to lunch with different fish and pork dishes. Bar opened 10-midnight. On arrival issued with a blue card (registered to guest) and a green card for glasses, To get a drink from the bars both cards were required the green one being retained as a glass deposit and he blue returned. A 2nd, 3rd etc and you need the blue card each time, the green card got returned when you took your glass back for the final time. The pool area had thin plastic highball type (glasses) as no glass was allowed in the pool area. One drink per blue/green card. Spirits were generous double measures with ice. Access to the pools was via a couple of flights of steps below the main hotel. My wife uses a walking frame and struggled to access the pool via the steps. The hotels solution was to use the emergency exit in the dinning hall to get to the pool and let the lifeguard know when she wanted back in and the emergency exits was opened to let her back in. 7 floors with numerous lifts that lead to different areas, one to the bar, two to the food hall,reception and a further lift to reception. Large bar with stage which showed the football and evening entertainment, kiddy disco, adult disco, karaoke, dancers, magician on different nights. There was also a games machine area with a couple of pool tables, popcorn machine and comfy seats. Two smoking area with tables and chairs one by the pool and one by the bar/main entrance. Pools well kept with ample sun loungers open 10-1900. The rooms are dated but well maintained and cleaned daily. All the staff are friendly and helpful. Food and drink plentiful with something for everyone. Good for the price you pay. Can be noisey around midnight when the bar closes as the room walls seem very thin. Booked last minute so cheap. We would definitely stay again. Spent 4 nights there and tbh I wish it was longer the hotel itself is what it is. If ur expecting 5 star pay for it. Food was ok always something different to eat. Staff where friendly and attentive. Before we went I read the reviews and was dreading it. But tbh the moaning in my opinion was unfounded. Yes the walls are thin. And it does need updating but I found the rooms cleaned every day. Fresh towels etc. Pool clean staff friendly and met some fantastic people. Would I go back there.......Oh most definitely. The staff were all very helpful and nothing to much bother for them. The food was good and varied and always something to eat . Would recommend it to anyone! Good hotel. Don't believe all you read!